We take a deep dive into what makes the 11th generation great. The Toyota Corolla is not a car that elicits much excitement among gearheads but that doesn’t mean it’s not incredibly important to the automotive world. Since its release in 1966 the iconic economy car has sold over 40 million units worldwide, good for first place all-time. The Corolla sells so well for many reasons, a few of which we’ve highlighted in this walkaround video review of an 11th generation model, perhaps the best-looking Corolla aside from the classic boxy models of the 1980s. Unfortunately we haven’t gotten the chance to get behind the wheel of a Corolla this year so we don’t have a full review to share. But in this walkaround video you will get to take a deep dive into all of the compact four-door’s nooks and crannies. The Corolla’s main selling points have always been its reliability, affordability and fuel economy. However, there’s so much more to this car than just the fact that it gets great gas mileage and is a steal at $17,300 (base price). We get into everything that makes Toyota’s top-seller great in this video, so check it out for yourself. 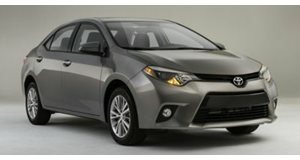 We’d like to thank Toyota Walnut Creek in Walnut Creek, California, for letting us shoot its Corolla.